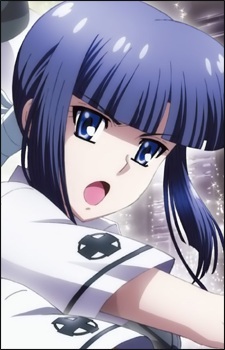 Kanade is another of the lead female characters. Kanade seems to have two sides to herself and during his first night at the school dorm, she attacked Tomo in order to prevent him from receiving the Asura Machina and starting a new series of fights as a consequence. She seems to have a taste for cosplaying as a miko. She is 'Devil' and, as such, has supernatural powers which she uses mainly to create fire. Whenever her powers are active, her eye-colors change to blue and light green. She develops crush on Tomo, but avoid pursuing such feelings so not to stand between the boy and Misao.